Zip-Lining (Treetop Trekking) – you actually zoom out over Heart Lake! This conservation gem in Brampton, teams with wildlife and beauty. Roads in the park are accessible to various levels of cyclists. Trails, particularly at the south end require more skill and are best cycled on mountain bikes. Cyclists can visit Heart Lake Conservation Area main entrance via Heart Lake Road, between Sandalwood Parkway and Mayfield Road. Cyclists are welcome to enter free of charge! The south end trail can also be accessed from the parking lot on the south side of Sandalwood Parkway, just west of Heart Lake Road. The route starts with a tunnel under Sandalwood and then enters the trail system. Again, skill is required for cycling this route. The southwest side of the park can be accessed through a small entrance in the fence from of Richvale Park. Check out the Gitigaan Mashkiki (Medicine Wheel Garden), which honours Mother Earth’s seasonal cycles. As the garden changes, the circle of life also continues. The park also offers Wild Wetland Splash and Pool, and fishing in Heart Lake. Rainbow Trout are stocked from TRCA’s fish hatchery at Glen Haffy Conservation Area. The top image featured is from a cycling planning ride in Heart Lake, fall 2016. 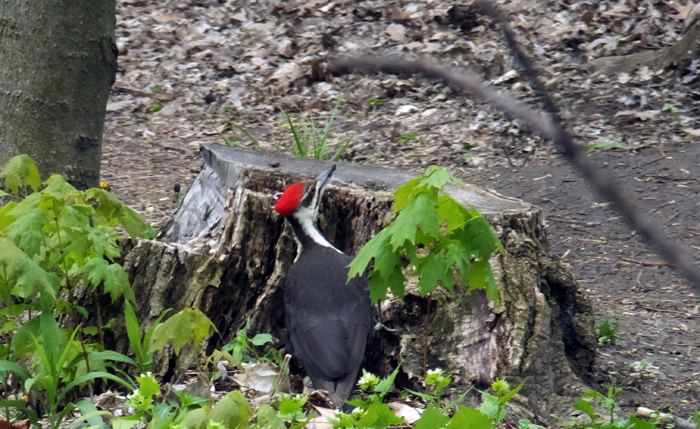 This Piliated Woodpecker was photographed along the trail in Heart Lake Conservation Area, summer 2016.